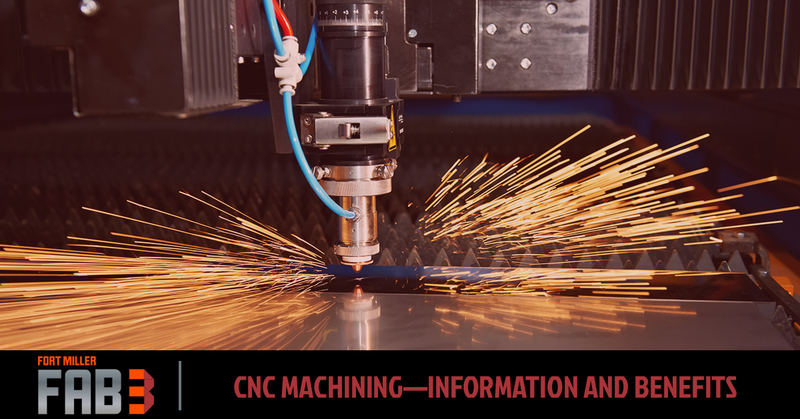 CNC (computer numerical control) machines are electro-mechanical devices that use computers to control machine tools, like lathes, mills, routers, plasma cutters, and grinders. The first CNC machines were developed in the 1940s and were largely reliant upon an old technology known as punched tape technology. Since then, CNC technology has come a long way. They are now used for the automation of machines that can remove, shape, and fabricate metal, as well as other materials. At Fort Miller Fab3, we use CNC machining for custom metal work. Specifically, we mostly use our CNC Vertical Mill to produce a wide array of products for a variety of applications. Included among the many materials we can fabricate are brass, aluminum, steel, alloys, and even plastic. In today’s blog, we would like to introduce you to some of the different types of CNC machines commonly used in metalworking. Read on to learn more, and contact us for all your metal fabrication needs. Milling machines are one of the most common and conventional types of CNC machines in use today. Using rotary cutters, these devices are capable of shaving, cutting, and removing sections of material. As opposed to manual milling, CNC milling can be programmed to meet exact specifications—depth, angle, direction of cut, etc. Lathes are essentially the inverse of drills. Whereas a drill works by spinning the bit and putting it in contact with material, lathes work by spinning the block of material against the bit. As the material turns, the cutting tool shapes it into its desired form. This flexibility, along with the precision of CNC technology, makes it the perfect tool for the manufacturing of spherical and cylindrical shapes, as well as symmetrical objects. When you have a material—aluminum, steel, plastic, etc.—that needs holes made, CNC drilling machines are a great option. Because they can be programmed to drill with almost exact precision over and over again, they are perfect for large-scale jobs. CNC grinding machines use a rotary wheel to abrade the material until it has reached its desired shape. Because CNC grinders are easy to program, often times, metal fabricators will use grinders over lathes for jobs that don’t require a high level of precision. With typical plasma cutters, material is cut using a plasma torch. This process is most typically performed on metal materials, but it can be applied to other surfaces. To reach the heat and speed necessary to cut through metal, CNC plasma cutters use a combination of compressed-air and electrical arcs to ensure precise, clean cuts. As you may have gathered, CNC machines allow for a level of consistency and precision that would be difficult—if not downright impossible—to achieve using manual methods. At Fort Miller Fab3, we utilize this marvel technology to help meet all your fabrication needs. We eat, sleep, and breathe metal fabrication. Our engineering team and skilled operators take great pride in working together to deliver consistent, quality parts for your specific needs. Whether you need metal bending, robotic welding, plasma cutting, or some other fabrication service for our CNC machine shop, we are here for all your fabrication needs. Check out our capabilities here! Contact Fort Miller Fab3 today to learn more!